Sometimes after gorging ourselves 24/7 with salted caramel truffles and a glass too many of Prosecco during the festive period means it's doubly hard to get back into the swing of healthier eating. Come the New Year almost all of us are vowing the eat all things green and nutritious in the aim of turning into Rosie Huntington-Whitely. 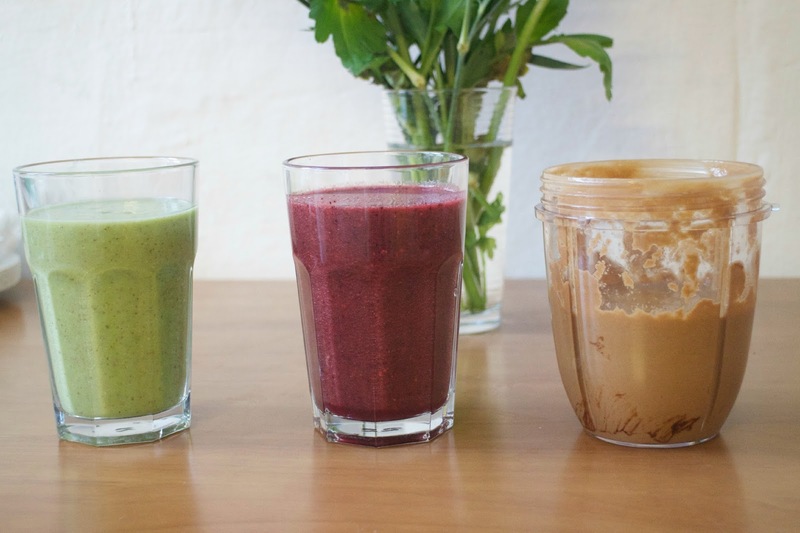 This isn't as easy as we'd like to imagine so today, I've got some seriously easy, nutritious and delicious smoothie recipes to ease you back into a healthier, happier lifestyle. 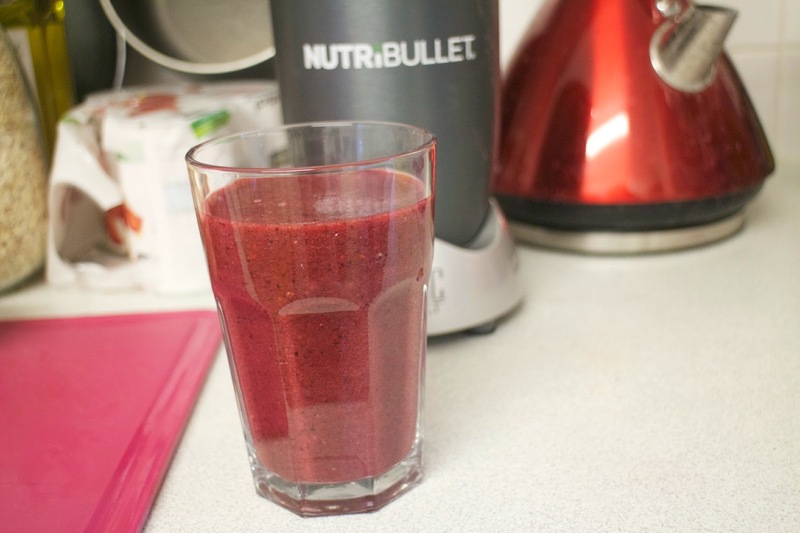 I was incredibly fortunate to receive a Nutribullet for Christmas like many others, and thought this would be the perfect opportunity to rustle up some recipes using this amazing machine. You can use a blender if you don't have a Nutribullet however I cannot recommend a blender enough as it's really a 'nutrition extractor' which means it extracts all of the nutrients from what you're blitzing up and creates a 'Nutriblast' meaning you're getting all the nutrients, all the fibre, all the goodness. It's compact, seriously powerful, easy to clean and makes you want to make every meal in it. There's also a video that goes alongside this post over on my YouTube channel and at the bottom of this post! Totally perfect for anyone and everyone. 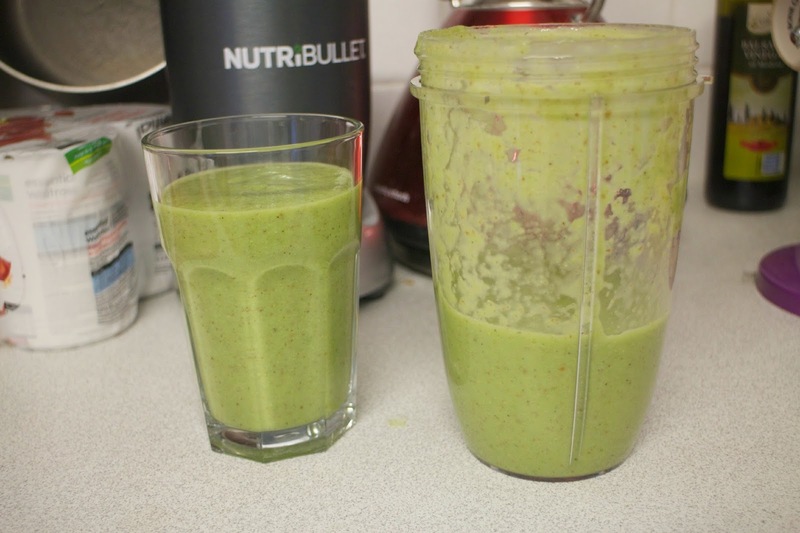 We all need a bit of green goodness in our lives and this is a perfect drink to have first thing in the morning. Bursting full of Vitamin C, Iron, Omega 3 fatty acids and other fantastic nutrients to transform you into a green Goddess. Kale is a true superfood, packed full of iron, vitamin C and calcium meaning it'll improve production of red blood cells, will get your skin glowing and encourage stronger bones. Not only that but it's a fantastic antioxidant ingredient. The Green Goddess is full of other antioxidant ingredients such as the Green Granny Smith Apple which aids to neutralise any free radicals that can encourage harmful diseases. Despite this having sugar from the fruits, the apple will help to stabilise your blood sugar meaning you don't suddenly crash half an hour after drinking this beauty. Kiwi's are packed full of Vitamin C and can reduce any inflammation in the body. The mint is fantastic for your digestive health and mixed with the fibre in the drink, will help to keep you 'regular' (you know what I mean...). Anyway you can get avocado into your diet, the better - the essential fatty acids will give your skin back its plumpness and glow and help your heart by lowering cholesterol. A spoonful of flaxseed will add an extra boost of omega 3 and also magnesium, manganese and Vitamin B. 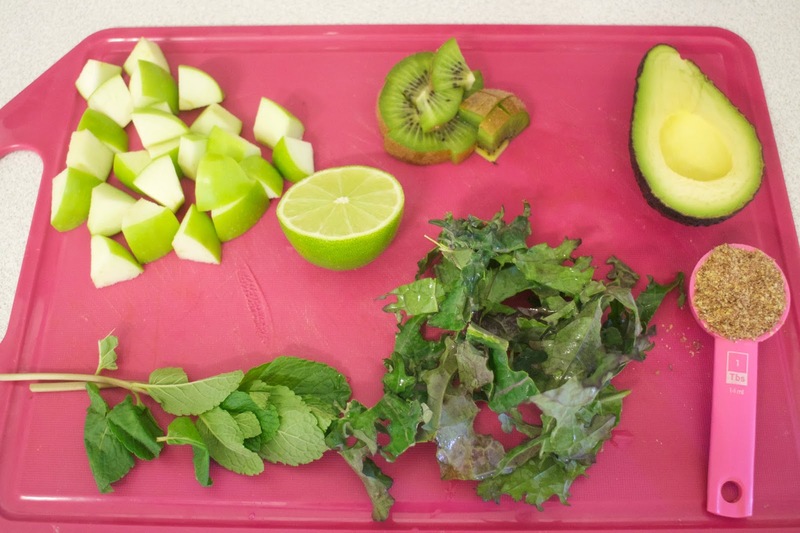 Without the avocado this makes a very vivid green drink and with the avocado it promises a silky, creamy drink. Drink up! This is for any of you who are struggling to keep those post-Christmas chocolate/wine breakouts at bay. 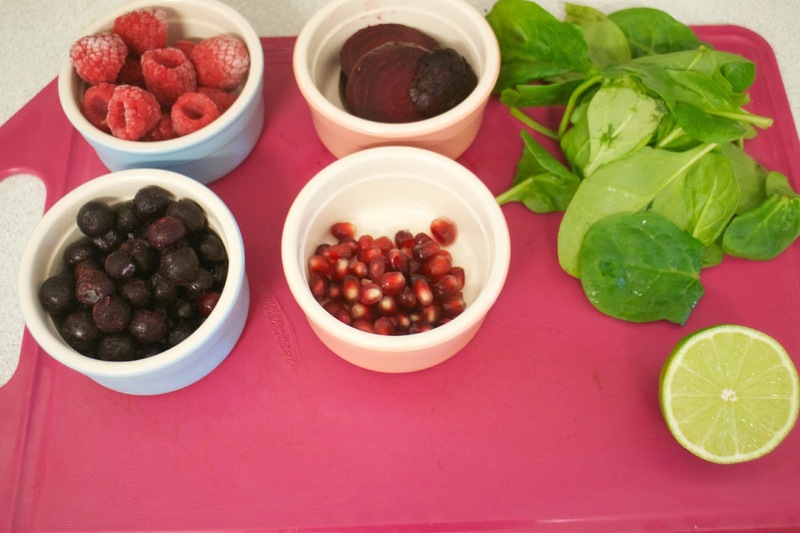 As someone who has PCOS, too much sugar is a massive aggravator upon my hormones and skin and this smoothie has some great low sugar ingredients and also hormone balancing nutrients to calm everything down and get your skin glowing. Berries are your best friend if you're trying to reduce the amount of sugar in your diet as they have the least amount of sugar (and plus they're the tastiest, don't you think). When they aren't in season, go for the frozen variety as it'll work out cheaper and they'll taste better. Raspberries are really high in antioxidants and Vitamin C which are crucial nutrients for your skin, and blueberries are low GI and therefore have a better impact upon blood regulation (and means less of those pesky under-the-skin spots!). The manganese in blueberries also promises the production of collagen meaning your skin will loos gorgeous and plump. Beetroot is an excellent source of folic acid which is crucial for hormone regulation as it helps with fertility and is much needed during pregnancy. Pomegranates encourage skin cell regulation and helps sooth the skin during breakouts. The naughtiest sounding of the lot but I promise it's a lot healthier than it sounds. Cacao is the purest form of cocoa powder you can get - it's essentially ground up cocoa beans. Cacao will help to improve circulation and lower blood pressure and promote cardiovascular health but also helps to make you feel better and releases phenylethylamine which is the same chemical our brain releases when we fall in love. Not only that it's packed full of magnesium, iron, zinc and several other minerals. SO much better than regular processed cocoa powder! 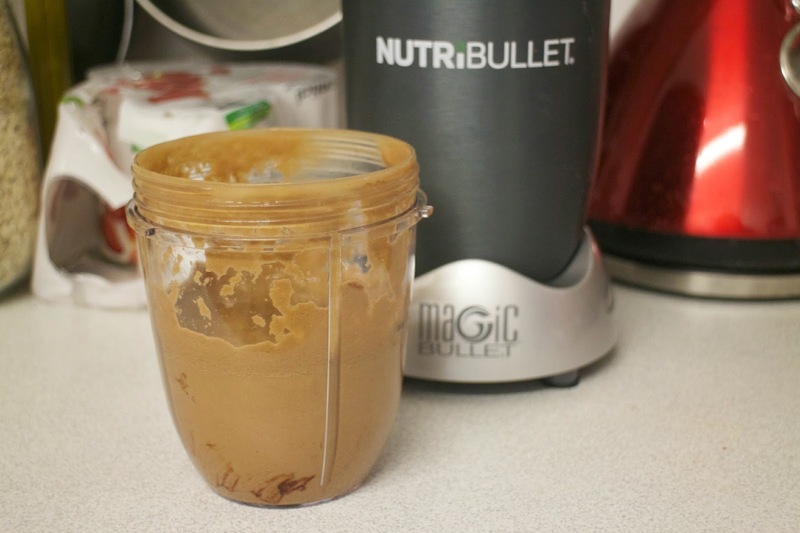 Peanut butter adds a source of protein and boosts the healthy fats in this shake, plus packs in plenty of potassium to help with your cardiovascular health, energy and also contains lots of fibre. Now, maple syrup is still sugar, no matter how pure you get it - your body will eventually metabolise it in the same way as all other sugar and sweeteners. However, it does add nutritional value unlike plain white sugar as it contains iron, zinc, manganese and potassium. Go easy on it - everything in moderation. Oh, and don't worry, you won't be able to taste chocolate-y, peanut butter-y avocado. The avocado adds to the creamy texture and adds all those great nutrients! Phew! So I hope these recipes are useful for any of you who are struggling to find easy and simple ways to get some better nutrients back into your diet. If you do create any of these, please let me know! I'd love to see you Instagram me or Tweet me, or even just leave a comment! I hope you also enjoy the video too and don't forget to subscribe for more videos. I am always looking for new drinks recipes, but I do agree with avocado, just makes every so creamy!